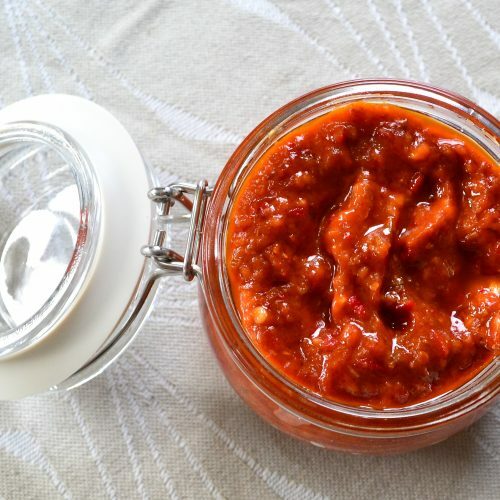 Harissa is a hot, slightly smoky and very aromatic paste made from chilies, garlic and fragrant spices. It is used in North African and Middle Eastern cuisines as a condiment, or mixed with water, oil or passata to add a punch to stews, soups or couscous. I have had a good chili harvest this autumn, so I dried and froze a whole bunch of them, yet still had a lot left. 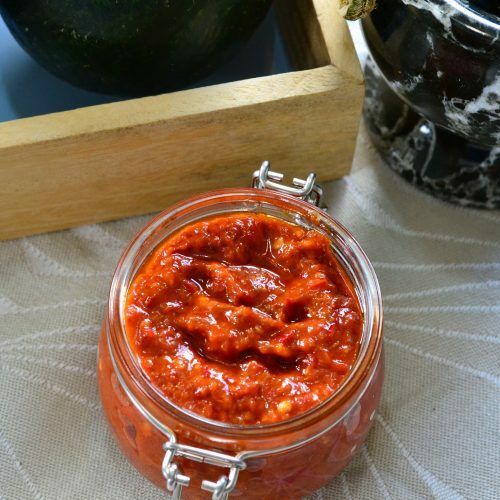 I found the best way to utilize the abundant harvest of chili peppers is to make hot condiments from them, because they last so song, and my absolute favorite is Harissa paste. The reason it is my favourite is because Harissa is made with a lot of other spices that add a unique pungent taste which is detectable even though the paste is very strong. Very strong. If it would be for sale in a shop it would probably have 4-5 chili marks on it. Just half teaspoon will be enough to make the whole pot of curry medium hot. Use disposable, talc free gloves if you tend to touch your face absent-mindedly or if you have small kids you have to handle. Actually, just use gloves regardless. I have made a mistake of not using gloves and my fingertips were burning for 2 days! Despite all the washing. I even tried to soak my fingers in milk and butter, because capsaicinoids are fat soluble, but it did not help. Chose the best spices for this paste. I buy organic spices in bulk and it makes a whole lot of difference to a taste, especially when you make something that consists mostly of spices. Also, do not be tempted to use ground spices here. The point of using whole spices is to dry toast them fist, so that they would release their oils, then grind them. The smell and taste will be much better. 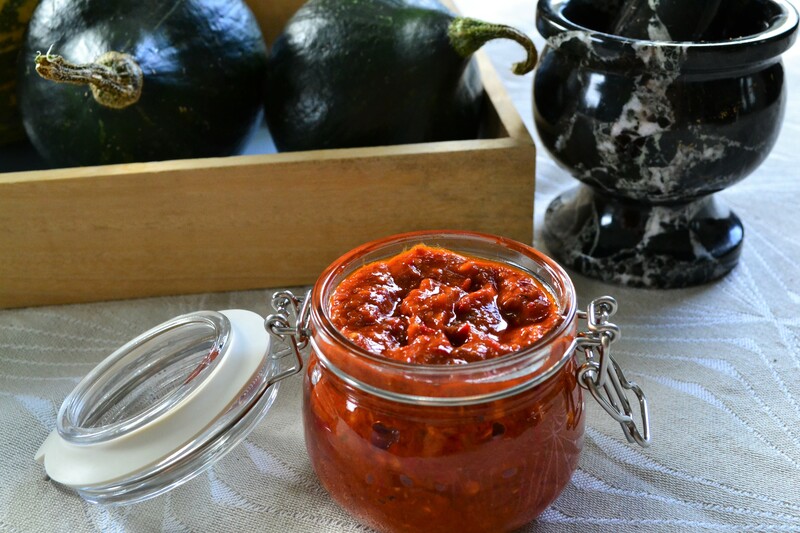 Packaged in a nice jar, this Harissa will make a nice present for someone who likes hot and spicy meals. 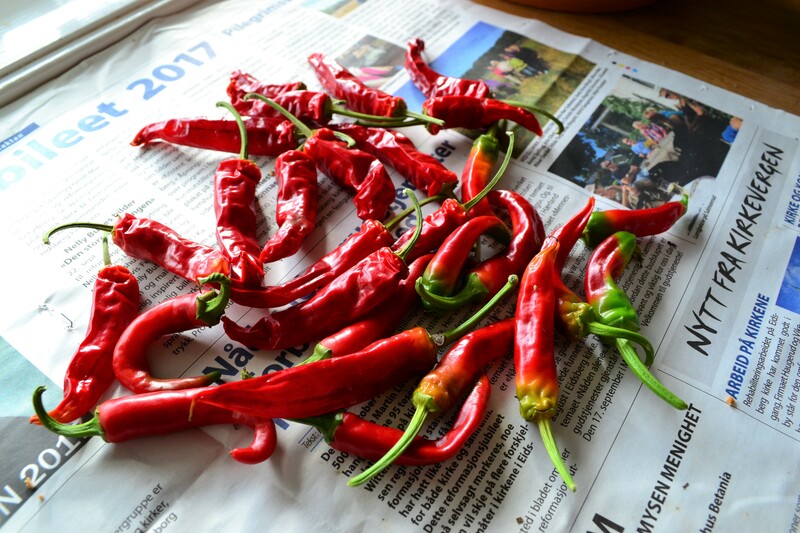 Remove stalks and seeds from chilies. If they are very small, like mine were, remove as much as possible. Harissa will be smoother and milder if seeds are removed. Place chilies in food processor or blender (use smaller bowl if you have it). Toast dry spices in a hot pan for a minute or two*, just until they release their smell. Shake the pan in a process to prevent spices from burning and to feel like a proper chef. 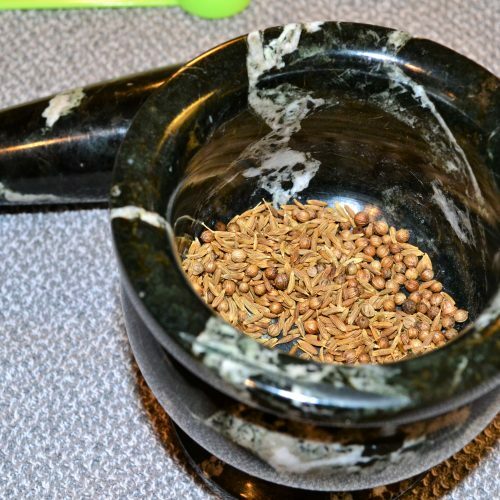 Grind spices to powder in mortar or spice/coffee grinder. Don't attempt to do this in larger blenders - it won't work. Add ground spices, garlic and salt to food processor and pulce once of twice. Gradually add olive oil, and pulse more, scraping the bowl of food processor if necessary, until you have a smooth(ish) paste. Place harissa in a clean jar and top with olive oil so it covers the surface completely. Store in refrigerator and top with oil every time you take some out. *Don't skip this step. Dry toasting whole spices releases aromatic oils in them, making it easier to grind them and resulting in deeper flavour and lovely smell. Easy to make, two ingredient marzipan.